title: Theory of Philosophical Development. Sofia: Sofia University Press, 2010, pp.284. At a time when narrow specialization has become quite characteristic of philosophy as a discipline, it is only natural that one would be surprised to find a book titled Theory of Philosophical Development (hereinafter abbreviated as TPD). Alexander Kanev’s ambition is no less than to reveal fundamental structural traits, interactions and transformations that have determined the course of Western philosophy from its birth on the Ionian coast to its contemporary transatlantic forms. Well aware of the unusual nature of his project, the author convincingly argues the need for such undertakings in the context of the fragmentation of the discipline. To researchers engrossed in subtle textual analyses, the book offers a fresh, stimulating look at the whole called ‘philosophy’. 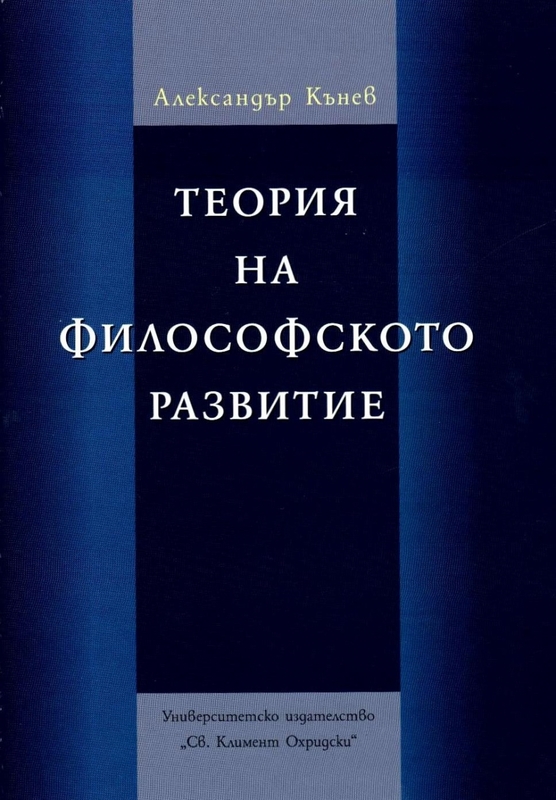 TPD builds on the results of Kanev’s previous extensive studies and, more particularly, on his two-volume Western Philosophy: Paradigms, Revolutions, Perspectives (hereinafter abbreviated as WPPRP), to further expound, modify and enrich them. Those who have read WPPRP are aware of the power of Kanev’s synoptic approach. In TPD the author’s undertaking is just as comprehensive in scope, but it has undergone important modifications that have increased the complexity and depth of the proposed concept. Central to Kanev’s theory are Thomas Kuhn’s concepts of ‘paradigm’ and ‘revolutionary change’, which are applied here to philosophy. This makes Kanev’s project similar to the historico-philosophical approaches of authors such as Herbert Schnädelbach, Karl-Otto Apel and, to some extent, Richard Rorty. Kanev identifies three paradigms in the history of Western philosophy: ontological (the dominant paradigm from Antiquity to around the middle of the Modern Age), epistemological (until the beginning of the twentieth century), and linguistic. He proposes a groundbreaking thesis: that paradigm revolutions are preceded by specific preparatory turns which he calls ‘methodological revolutions’. For example, Descartes conducted only a methodological revolution when he shifted the focus of philosophy onto the study of knowledge – for despite the change of method, he preserved the task of the old ontological paradigm, namely, to acquire knowledge of reality independent of the mind. By this, however, Descartes already gave an important impetus to the turn towards the new epistemological paradigm carried out by Hume and Kant, in which the study of ‘reality itself’ is no longer important. The other groundbreaking moment in Kanev’s concept is the thesis that paradigm differences and struggles acquire their content from basic orientations in the ways in which the relationship between reality, knowledge and language is thought of, and more particularly, in positing whether one of the members of this group represents the previous ones or not. Scholars who follow the epistemological paradigm reject the idea of the ontological paradigm that thinking merely represents being, and posit that the relationship is arepresentational, in this case, constitutive. In a similar way, scholars who follow the linguistic paradigm abandon the idea that language merely represents some sort of extra-linguistic mental contents. This concept is preserved in Alexander Kanev’s new book. The most important element that develops and modifies it here is the serious encounter with the extremely important question of diversity, of disagreement. This is of course related to the most obvious global critique that can be made of Kanev’s project. Doesn’t the search for paradigms and global trends in philosophy hide the truly interesting and profoundly specific – at that, precisely now that even terms like ‘rationalists’ and ‘empiricists’ have began to sound not only dated but outright uninformative? In this sense, addressing the problem of diversity, articulating structural factors that determine diversity and integrating them into the concept of the paradigm-revolutionary development of philosophy is a logical step and one of the main merits of TPD. With his new book, Kanev also wants to give an account of a problem that has chronically troubled philosophy, threatening its very raison d’être – namely, the constant lack of consensus among philosophers on the sense and results of their studies. In a provocative move, here he defends the thesis that the absence of consensus is in fact not merely a substantial feature of philosophy, it is something far more important: it is the main driving force of its development and transformation (see, for example, p. 132). The book is divided into an Introduction and twelve chapters. It gradually and accumulatively explores the problematics under study, completely in line with the author’s concept of the multitude of intertwined levels of forces determining the development of philosophy. Considering the complexity of the task, the style of exposition is especially noteworthy: it is strict and clear, unpretentious and careful in its theoretical claims, at times not lacking in irony. In the Introduction, Kanev defines his undertaking as a sort of metaphilosophy whose starting point is the history of philosophy or, as he puts it, a ‘historical philosophy of philosophy’. In addition, the author notes his strongly non-essentialist understanding of key concepts such as ‘philosophy’, ‘development’ or ‘structure’. Chapters 1 and 2 offer a brief critical interpretation of various concepts of philosophical and scientific development, from Hegel and Heidegger to Hösle, Kuhn, Lakatos, and Foucault. The section devoted to Randall Collins’s so-called sociology of philosophy is curious. Purely conceptually, what is most significant here is the critique of Kuhn and his conflict with Lakatos which, as the author himself notes, has influenced the proposed concept (p. 29). Further on (chapters 3 and 4) the author sketches out the main structures which he thinks have determined the development of philosophy. Explaining why he rejects the postmodern refusal to look for fundamental levels of determination, he allows that determination may not always be one-way and rigid and outlines, in his own words, ‘relative, flexible and dynamic hierarchies’ (p. 107) that reveal only ‘some structuredness, relative order, most general deep tendencies’ (p. 212). Actually, this openness is also characteristic of the way the author himself presents his undertaking – as a hypothesis that is subject to further concretization and modification. In Chapter 5 Kanev expounds the characteristics of the three paradigms identified by him, and in Chapter 6 he looks at the separate philosophical sub-disciplines. The problematics has already acquired momentum and depth in chapters 7 and 8, which are devoted to the so-called sub- and supra-paradigm currents in philosophy as well as to the so-called anti-paradigm movements – some of the most powerful sections in the book. According to the author himself, the role of the anti-paradigm oppositions is something which he underestimated in WPPRP and which here contributes to the concretizing dynamic. No less intriguing are the next two chapters (9 and 10), which are devoted to the mechanisms of transition between paradigms. The role is articulated of anti-paradigm movements that increase the tension against the dominant paradigm and create revolutionary resources for opposition – but only to be rejected with the advent of the new paradigm as relics of the old order. Hence the idea, expounded in Chapter 11, of a ‘negative-dialectic synthesis’ (pp. 230-231) which explains the rejection of the old oppositions while drawing lessons from them. One is impressed by the extent to which Kanev recognizes the non-linearity in the, generally speaking, linearly represented by him, development of philosophy, where old paradigms or parts of them remain dominant more or less covertly, or undergo partial revivals. The remaining part of Chapter 11 is a reconstruction of the paradigm-revolutionary transitions in the history of philosophy, identified by the author. In my opinion, here the section devoted to Heidegger and Gadamer is especially notable for its clarity and pithiness. Chapter 12 formulates a series of questions and tasks which the concept ought to answer in future. Regarding those directions of future development of Alexander Kanev’s undertaking, I would like to stress the need for a subsequent detailed analysis of the genesis and opposition of concrete philosophies, an analysis that would not only test but also allow an enriching modification of the proposed concept. The illustrative examples from the history of philosophy included in TPD are often schematic and not always entirely convincing. Of course, the purpose of the book is to argue a concept of the development of philosophy, not to present the history of philosophy. But from that point on, it is of crucial importance how Kanev’s concept will answer what the author calls the ‘empirical material’ from the actual history of philosophy. Far from being of purely doxographic interest, such questions are related precisely to the concrete conception of the historical structures of philosophical development – which is also the purpose of the author. That is why I believe such quests can further contribute to the articulation and argumentation of the concept. Here are several examples. Already in WPPRP, I was surprised by the ease with which Kanev stylizes the so-called German classical philosophy as a powerful counter-revolution designed to restore the old ontological paradigm. When Schelling posited that the concept is alive in nature itself while Hegel set out to claim that the thing-in-itself is the thing-for-us, all ideas of a representing approach towards being that is independent of thinking seemed already abandoned forever. Further on, if we take seriously the degree to which the mature Hegel absorbed Kant, then it would not be difficult to read the history of the absolute spirit as a history of the realization of the grounds for the claims that thinking makes on the world – grounds rooted in thinking itself. But on the other hand, it is true, as Kanev clearly notes, that it is difficult to classify German idealism as a paradigm called ‘epistemological’… If all that is true, then the concept of the content of philosophical paradigms could undergo some important modifications. Also, attention ought to be paid to the factors determining the positioning of a given philosophical current as sub- or anti-paradigm. For example, could one claim that Marx is simply an anti-paradigm thinker – given not only his enormous influence but also the existence of more than one successor-schools of thought? The difference between anti- and sub-paradigm, as the author notes, is extremely flexible; further elaboration of this observation – again parallel with a concrete historico-philosophical analysis – could enrich the concept. Those are not problems that are ignored in the book – as evidenced also by the provocative and heuristic generalizations formulated by the author. According to Kanev, with the development of philosophy, the internal structures have become ever more dynamic and the boundaries ever more provisional (p. 257). The different currents have not only multiplied, they have become intertwined in ever more complex ways. This fact, along with the disillusionment with the powerful claims of the previous programmes, makes every next paradigm weaker, less ambitious and less generalizing than the previous one. Which, incidentally, also explains the undertaking of purely methodological revolutions before deciding on a paradigm break (pp. 209-210). Although he defines the syntheses conducted upon the philosophical turns as negative, Kanev keeps a sense of continuity, of immanent connections in the development of philosophy – arguing against some current rival theories (for example, the change of vocabulary in Rorty, pp. 223-224). Ultimately, in order to justify itself, any new undertaking must give a satisfactory explanation for the failure of the old one – and this is even more important than offering clear prospects for success (p. 210). The history of philosophy turns out to be, to some extent, an account of a constant failure. Of course, this is not the complete standpoint of Alexander Kanev, who in TPD has kept his optimistic outlook from WPPRP about the future of philosophy. With his new book, he shows that there is good reason to regard a cognitive undertaking, moved precisely by disagreement, as meaningful. We can hope that this subject will be articulated in the author’s future publications.